New Ram Heavy-Duty Trucks About to be Revealed! Truck fans have been waiting for this news for some time now. After all the leaks and the teases, it’s finally time to take a look at what Ram is planning. The big reveal hasn’t happened just yet, but the date and the place has been announced. Ram will be pulling back the curtain this upcoming Thursday, the 27th, at the Texas State Fair in Dallas, Texas. 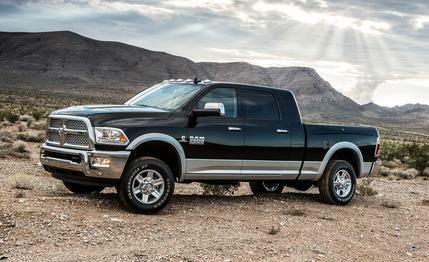 As the President and CEO of Ram, Fred Diaz, said it’s time to go big or go home. 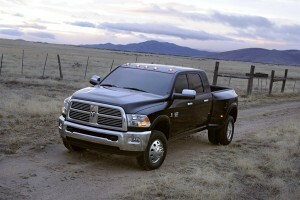 The Ram website has a count-down until the big national unveiling of the 2013 Heavy Duty and Chassis Cab trucks. If you’re impatient and just can’t find yourself waiting even another minute to see what Ram’s future looks like, you can view the whole event live online by live streaming thanks to the Chrysler Electronic Communications Team. The whole thing goes down starting at 10 a.m. ET this Thursday, Sept 27. Definitely something for any heavy-duty truck fan to be excited about. The new 2013 Ram 1500 is already getting lots of love from the public and critics alike. Ram is doing everything they can do to make sure they are the name on everyone’s lips when it comes to trucks. 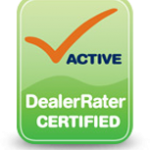 Bayside Chrysler Jeep Dodge has our new and pre-owned inventory available online. You can even schedule yourself a test drive. Like our Facebook page and follow us on Twitter for more Ram news and deals that you can redeem at the dealership! “Stories of Glory” are any inspiring sports stories of yourself, your child, or someone you know. They can be the story of a high school coach who changed your life or your child’s first home run. 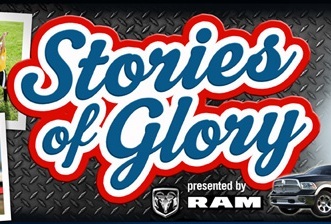 To have your story considered, go to http://blog.ramtrucks.com/stories-of-glory/ and in 800 characters or less, tell your story. You can also include video or pictures if they are available, but they are not required. One winner will receive an all-expense-paid trip to Connecticut and will be interviewed on The Dan Patrick Show. Three runner-ups and thirty-one sweepstakes winners will receive swag bags from The Dan Patrick Show and Ram. Do you have a Story of Glory to share? The deadline is August 21, so make sure you get in your entry soon! Also, check out the full Ram line-up online here, and keep up with the latest Ram news by liking Bayside on Facebook, following Bayside on Twitter, and subscribing to Bayside on YouTube. Win at the Pump with Ram! With gas prices up and down daily, drivers are dreading their trips to the gas station this summer. New car buyers are looking for more fuel-efficient cars, and surveys show that fuel economy is the most important factor to American car shoppers. Ram wants to ease that worry at the gas pump by giving away free gallons of gas all summer. One lucky winner will receive 500 gallons of gas, and one hundred weekly winners will receive 32 gallons. The contest kicked off April 5 and goes through September 1, 2012, so there is still plenty of time to enter and win. You can fill out the contest entry form here, and make sure to only enter once. Multiple entries or entries under the same e-mail address will be disqualified. Imagine how far 500 gallons of gas could take you this summer. Those trips to the pool, the park, and the grocery store add up quickly, and instead of paying for pricy airline tickets, you could take the family on a road trip for vacation. No matter how you would use it, Ram’s Gallon Guarantee contest should not be missed. Check out the full Ram line-up on Bayside’s online inventory here, and keep up with the latest news from Chrysler, Jeep, Dodge, and Ram by liking Bayside on Facebook and following Bayside on Twitter. 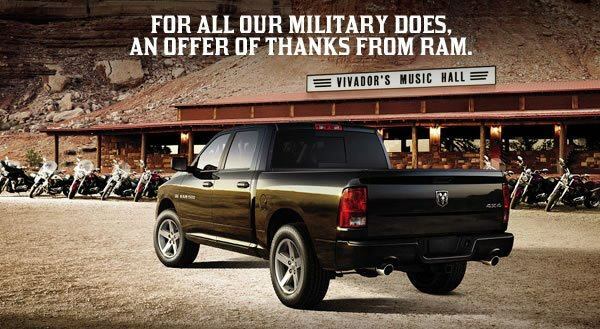 Next Monday is Memorial Day, a day that Ram takes very seriously, and this year Ram teamed up with one of country music’s biggest stars to pay tribute to America’s heroes. 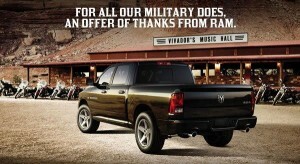 Ram asked for friends and family to nominate a military service-member for the National Ram Military Hero Contest. The winning service-member and the person who nominated them would win a trip to Las Vegas for the 2012 Academy of Country Music Awards and would get to meet country music star Craig Morgan. 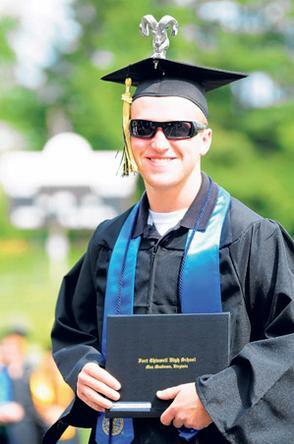 The 2012 honoree was Army Pfc. Brandon Sapp of the 1st Calvary Division from Fort Wood Texas, who was killed by a homemade bomb. For his service, he was awarded the Purple Heart, the Bronze Star, and the Good Conduct Medal. His father John accepted the National Ram Military Hero award on his behalf last month as part of the ACM Awards weekend events. At Bayside Chrysler Jeep Dodge Ram, we want to encourage our readers to honor our military service-members all throughout the year as well as during Memorial Day weekend. You can keep up with the latest news, events, and incentives (including our Military Incentive Program) from Ram by bookmarking Bayside Chrysler Jeep Dodge Ram, liking Bayside on Facebook, and following Bayside on Twitter. 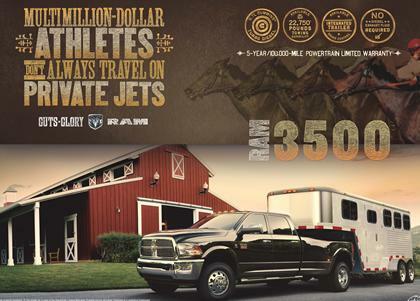 As all eyes were on the Kentucky Derby this past weekend, all eyes were also on Ram trucks as well. For the past 3 years, Ram has been the official truck of the Kentucky Derby, one of the most famous sporting events in the world. 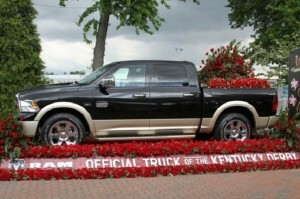 The Ram brand was everywhere at Churchill Downs from posters to vehicle displays and uniforms. Derby winner I’ll Have Another might have even gotten a little jealous at how much coverage Ram received. At first glance, Ram seems out of place next to the fancy dresses, exotic hats, and mint julep-sipping crowd, but on closer look, the partnership makes perfect sense. The Kentucky Derby might be a high-class affair, but the road to the Kentucky Derby is rough. This sentiment is echoed in their campaign for the Kentucky Derby which was “Hard-Earned, Not Hard-Won.” Every day, horse owners need a reliable truck and trailer, and they can appreciate Ram’s customizable towing features and tools that help horse owners find the best truck to fit their needs. There is a saying that behind every great man, there is a better woman. Well, one of the best kept secrets of the Kentucky Derby is that behind every race horse, there is an incredible trainer and a great truck. Ram has a truck for every towing and driving need, and you can browse Bayside’s inventory of new and used Ram trucks online here. You can also keep up with the latest news from Chrysler, Jeep, Dodge, and Ram by liking Bayside Chrysler Jeep Dodge Ram on Facebook and following Bayside Chrysler Jeep Dodge Ram on Twitter. Ram wants you to man up and share your RAMActs. Ram kicked off the month of May by daring its nearly 27,000 Twitter followers to get their blood flowing and show what their made of with Random Acts of Manliness. What is a RAMAct? A RAMAct is doing something extraordinary. Get a tattoo, climb a mountain, face your fears, and man-up, and post a picture or video to Twitter with the hashtag #RAMActs. If Ram’s female fans feel left out by the campaign, they don’t need to fear. RAMActs aren’t only for the boys and men. Last night, Ram tweeted, “Random Acts of Manliness aren’t just for men! Ladies can join in the movement too,” so Ram ladies can step up to the plate and brag about their own RAMActs. Will you be joining in the RAMActs movement? 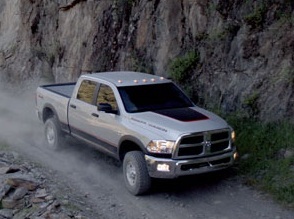 Follow Ram on Twitter @RamTrucks, and check out Bayside’s inventory of Ram trucks online here. You can also keep up with the latest news and promotions from Chrysler, Jeep, Dodge, and Ram by liking Bayside on Facebook and following Bayside on Twitter.